Opponents of the Affordable Care Act rallied hundreds of conservatives at a Tampa hotel Wednesday night with a call for the Republican House to strip funds for the law out of next year’s budget. The budget vote is scheduled for right after Labor Day, in time for the 2014 fiscal year, which begins Oct. 1. “Can we defund Obamacare? Yes, we can!” declared Mike Needham, CEO of the host group Heritage Action for America. The crowd applauded heartily at his use of President Barack Obama’s campaign slogan. The town hall meeting in Tampa was heckle-free, unlike the one on Tuesday in Dallas. The host group, affiliated with the Heritage Foundation, is hopscotching across the South, firing up the anti-Obamacare troops during Congress’ August recess. Needham said that U.S. Rep. Gus Bilirakis, a Republican from Palm Harbor, has already pledged not to vote for the budget if it contains spending for implementation of the Affordable Care Act. Needham called on the crowd to pressure other members of Congress to follow Bilirakis’ example. The law doesn’t really talk about the doctor-patient relationship. DeMint did not explain what he meant, except for mentioning there will be many newly covered patients competing for doctors. The law offers primary care doctors a Medicaid pay raise, provides health-training scholarships and loans, and requires doctors to gradually shift from paper to electronic medical records. DeMint said the Republicans in the House are well aware that their many votes to repeal the Affordable Care Act are meaningless, since the Democrats in control of the Senate will not consider it. 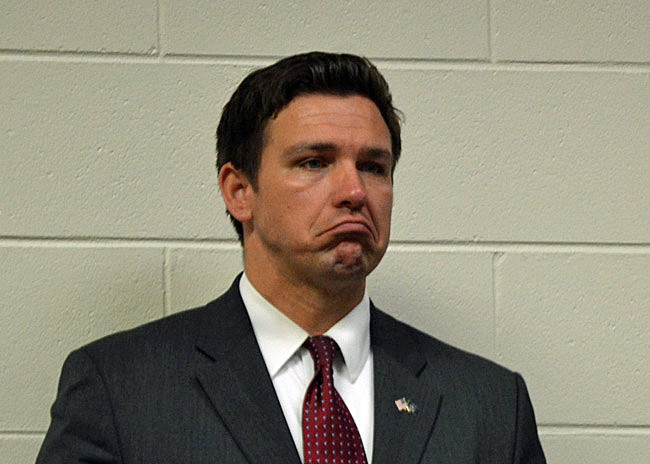 But a vote for a budget that strips out health-law funds is a different matter, he said. The Senate and President will be forced to choose between accepting the budget without health-law funds or leaving the government without spending authority after Oct. 1. There is no time to waste, he said. On Oct. 1, the online Marketplace is scheduled to open, where uninsured people can shop for a plan. On Jan. 1, the requirement that most Americans carry insurance or pay a penalty goes into effect. “By this time next year, tens of millions of Americans will have lost the insurance they had; they will be in these exchanges. It will be very, very difficult to unravel this thing. So this is the time. This might be that last off-ramp for us to stop Obamacare before it gets so enmeshed in our culture that it’s impossible to change,” DeMint said. While the “defunders” of Obamacare were inside the Crowne Plaza, about a dozen of its defenders stood in the rain out front, carrying signs and waving to traffic on busy West Kennedy Boulevard. Karen Clay, 60, hasn’t had health insurance since her marriage ended 12 years ago; when she gets sick, she has to go to the emergency room because doctors won’t see her without insurance. She said she has to stay well to take care of her severely disabled son. “I need a colonoscopy; I can’t afford one,” she said. Of course, we can’t help longer life expectancy. But it’s the Docs, medical facilities, and pharma companies who keep raising the costs and are making trillions doing it – not the highly government regulated insurance companies who only average a 2.5% profit per year. But in true WA DC political fashion, the echos Obama and his socialist friends hear from within their own bowels are drowning out truth and reason. Obama and the people who have made him a millionaire want our children and grandchildren to be slaves to the IRS, Social Security, Medicaid, and now Obamacare. We went to war with the Brits over a tiny tea tax. America is no longer a free nation when a business person has to give the IRS 39% in income taxes and then another 15.6% for SS and Medicare. 55% is %$#@ slavery! Your rant just proves that you know nothing about how insurance works. You can’t have guaranteed coverage for everyone without forcing everyone to buy insurance. Because if you tell the insurance companies that they have to take everyone who applies, regardless of medical history, but don’t force everyone to carry medical insurance all the time, what will you end up with? Everyone would wait till they’re sick to buy insurance, thereby ensuring that the health insurance companies go bankrupt because all their customers would be sick people taking out of the companies more than they were putting in. To keep the insurance system financially healthy, you have to force the healthy people to pay into the system, not just the sick people who are taking out more than they pay in. What else are we going to be forcing people to do for the common good? I have a preexisting condition and have made it a priority in my life to make sure I had health insurance. I’m fed up with this whole thing. Oh FOX Vombies. . . time to cut and paste your hate! 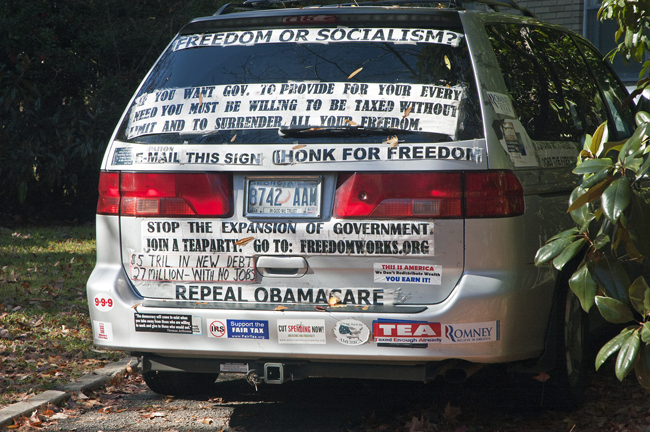 $50 says that the person driving the van in the above image gets social security and is on medicare. Or, the person has a comfortable lifelong government pension from the military, top notch, government “tri-care” medical, on top of the social security. Damn big government! How many of these “Town Hall” defunder people have Medicare? What hypocrites they are! They would saddle non-retirees with the considerable burden of THEIR first-class healthcare costs but try to bully their way out of sharing some of these resources with other Americans in need? Shameful! And spare me the argument about how they paid everything they get out of what was taken out of their taxes during their working life. Many of these Tea Party patriots will be getting much more out of the system than they paid in–Many already do. But if anyone tried to take away any of THEIR benefits, you can bet your life they’d yelp and spit like righteous scalded cats! As for any younger people who may be supporting this kind of crap, I can only surmise that they are downright stupid! Who do they think will help THEM out if, and when, they find themselves in need? Do they think that they are actually not paying now for services that are rendered in emergency rooms to the uninsured? Why do they think healthcare costs are so sky-high now? But, let’s not think with our heads in a reasonable manner. There’s a Black guy with a Muslim sounding name in the White house! It’s a plot to destroy the USA! Quick, let’s all rally with our guns and stop progress as we know it! Save me, Ronald Reagan! Rise up from the grave, and deliver us true Americans, in the name of Jesus and Ayn Rand! And the politicians who pander to this element are even worse and at least as morally reprehensible! Listen up, Tea Partiers: More Americans see through you than are with you. The last two elections should have taught you something. It seems you are as against reality as you are common sense, healthcare or anything else that might preserve our bodies and save our souls. So “activists” should just be trusted and allowed to carry on in secrecy right here in our capitol? Yeah right! If the GOP would put this much effort into actually coming up with a viable solution to many of these problems including health care, we’d be much better off. Instead, they like to continue this nonsense over and over again. And once again the Tea-publicans prove that they won’t let the truth be a barrier to their efforts to stop the ACA. But DeMint did get one thing right, when he said “Politicians don’t lead. …they follow.” And that is EXACTLY what the entire problem is with our current political system. No one steps up and LEADS voters to the right thing for the greater good. They are too busy asking what the polls say, what are the election implications with my key demographics, what will this do to my campaign contributions? We need more leadership and less “follow the voter” politics in our government. Republicans, Tea baggers and Conservatives just want you to die. Yhey talked about death panels in 2010, now they :own” them. I think the vops should break up these ralleys and Baker Act all attendees including the organizers and speakers. I am sure all the family members of employes at the UPS and Virgina University are thankful for Obamacare. And this is just the beginning. Hope most of you have your own insurance because many of you may be dropped from your spouses health insurance in the near future. @karma–Maybe the free ride of some SHOULD be sacrificed for the lives of many others…But, then again, I am sure that the Jesus you pray to on Sundays wouldn’t agree with me. It’s not about healthcare, it’s about their hate for “that black Muslim foreigner” in the White House which they’d much rather have stay white. If he was for breathing and signed a law demanding it, they’d be against it. @ elaygee: Damn! I thought the ACA was supposed to be about us! I’m getting pretty sick of everything being about “that black Muslim foreigner” in the White House. Maybe that’s the problem here….everything is always about him. I wish that the goverment would have opened up medicare to everyone. I must admit I am a little taken back by your post. You almost demonize a person who works hard everyday to take care of his family. And the family member is now “privileged” because they have health coverage from their spouses hard work and dedication? Do you know why health insurance was started? As far as Jesus on Sunday, If I am wrong, nothing lost. But if your wrong. Then what? @karma–Do I know why health insurance was started? Why, I would suppose it was to protect the health of people who have it. Apparently, you only believe that it should apply to people who can easily afford it. I demonize no one. What makes you think that all of those without health insurance don’t work hard to take care of THEIR families? Oh, I guess you would like to believe, in your compassionate Conservative universe, that people in the position of needing health insurance and not having it are all (a) unemployed and (b) on welfare, sitting on their couches all day, eating Bob-Bons and plotting ways to take your hard earned buck away from you. I think it’s great when someone and their spouse gets promised health benefits on a lifelong basis. It’s very disturbing when their pension company and/or insurer suddenly decides to welch on that promise. They should be very upset with their pension company and that insurer–I would be. But, please, don’t blame the government for the bad faith of others and please don’t use it as an excuse to deny other human beings, who perhaps aren’t quite as fortunate, the opportunity to protect their own lives and those of THEIR families. What I DO have a problem with are people who wrap themselves up in the American Flag while thumping their bibles and acting in ways that are privileged, selfish and entitled. I don’t have a problem with people watching out for their own interests but I DO have a problem with them doing it at such a high cost to others. I, too, will have to personally pay more for health insurance under the ACA but I understand why that may be necessary because being a good citizen of a great country like ours’ sometimes does require some sacrifice for the greater good. @ A.S.F. : Sacrifice for the greater good? It seems that under this administration, those trying to be responsible are the only ones doing the sacrificing. Why should any of us sacrifice? What’s wrong with a little RESPONSIBILITY from us all? I don’t want the government taking care of me. I want them out of my life. I worked hard all my life so that I would have health insurance and for that, you call me privileged? Stop the preaching, please. Keep up the “good work” of the current Conservative Agenda to reassure one more round of Democrats at the helm in 2016. Sooner or later the House and Senate will change some seats, hopefully in 2014. Make Obama one term POTUS….sorry, that is outdated news. Yes to women internal probes. Yes to hinder/ denied the right to Vote to minorities (mainly Blacks and Latinos do not mess up w/them). No to the right of workers to unionize. Yes to cut services to taxpayers by laying off government workers. Yes to denied government workers pensions contracts. Yes to privatize our education system by closing schools in favor of charters. Yes to pressure our US Postal Service pension contributions ahead of time, aiming at privatization. Whom do they believe will vote GOP, from all the affected above. The rich and the ones they think are rich are not enough ballots! Please remember, President Obama wanted a “public option”. . . similar to Medicare and the excellent systems in other civilized countries. . . to get us out from under the boot of private insurance companies. BUT NO. . . the GOP would NOT even consider it. A note from a lovely home and village “Socialist” Sweden (Denmark last month). . . the “people” here live peacefully without personal weapons. They smile and laugh a lot. . . they feel in control of their lives. They eat in a healthy way. I see zero fat people. There are some smokers (Ugh) but they absolutely smoke outside and away from others. They also cean up their cigarette butts and dog poop. . . as a matter of civic pride (no signs saying they must do or not do anything). They, together, determine what their civilization will be. They have excellent health care and many other services funded by a 25% sales tax. In common usage, the word capitalism means an economic system in which all or most of the means of production are privately owned and operated, and the investment of capital and the production, distribution and prices of commodities (goods and services) are determined mainly in a free market, rather than by the state. In capitalism, the means of production are generally operated for profit. In a purely capitalist economy, there would be no public schools, no state owned or maintained roads and highways, public works, welfare, unemployment insurance, workers compensation, Social Security benefits etc. Most generally, socialism refers to state ownership of common property, or state ownership of the means of production. A purely socialist state would be one in which the state owns and operates the means of production. However, nearly all modern capitalist countries combine socialism and capitalism. The University of Idaho, and any other public school or university, is a “socialist” institutions, and those who attend it or work for it are partaking in socialism, because it is owned and operated by the state of Idaho. The same is true of federal and state highways, federal and state parks, harbors etc. Most generally, communism refers to community ownership of property, with the end goal being complete social equality via economic equality. Communism is generally seen by communist countries as an idealized utopian economic and social state that the country as a whole is working toward; that is to say that pure communism is the ideal that the People’s Republic of China is (was?) working toward. Such an ideal often justifies means (such as authoritarianism or totalitariansim) that are not themselves communist ideals. Fundamentally, communism argues that all labor belongs to the individual laborer; no man can own another man’s body, and therefore each man owns his own labor. In this model all “profit” actually belongs in part to the laborer, not, or not just, those who control the means of production, such as the business or factory owner. Profit that is not shared with the laborer, therefore, is considered inherently exploitive. The word descends from the Latin ‘fasces’, the bundle of sticks used by the Romans to symbolize their empire. This should clue you in that Fascism attempts to recapture both the glory and social organization of Rome. Unlike communism, fascism is opposed to state ownership of capital and economic equality is not a principle or goal. During the 1930s and WWII, communism and fascism represented the extreme left and right, respectively, in European politics. Hitler justified both Nazi anti-Semitism and dictatorship largely on the basis of his working to fight-off communism. The church also played a major role in all of the European fascist countries (Germany, Italy, Spain, Portugal) as the authority on religious and moral issues, which was opposed to the threat of “godless communists”. @ Sherry: Communism is Utopian? Did I understand you correctly? Paradise awaits you in China. How often have you heard people refer to America as a Democracy? When was the last time that you heard America referred to as a Republic? There is a very good reason that our Pledge of Allegiance refers to our country as a Republic and there is a very good reason that our Declaration of Independence and our constitution do not even mentioned the word “democracy”. Many people are under the false impression our form of government is a democracy, or representative democracy. This is of course completely untrue. The Founders were extremely knowledgeable about the issue of democracy and feared a democracy as much as a monarchy. They understood that the only entity that can take away the people’s freedom is their own government, either by being too weak to protect them from external threats or by becoming too powerful and taking over every aspect of life. They knew very well the meaning of the word “democracy”, and the history of democracies; and they were deliberately doing everything in their power to prevent having a democracy.